Auckland centre, the older brother of Louis and Fraser. Anderson played for Northcote Tigers and Mount Albert Lions in the Auckland Rugby League competition before transferring to East Coast Bays Barracudas to play alongside his father Warrick. His father later coached the Barracudas to the 2003 Fox Memorial title. 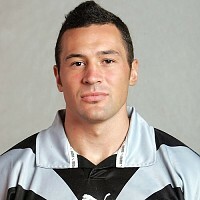 Anderson debuted for New Zealand Warriors in Round 17 of the 2002 National Rugby League, playing against Cronulla Sharksat Toyota Park on 7 July 2002. That year the Warriors went on to the 2002 NRL Grand Final, which they lost 30-8 to Sydney City Roosters. In 2003 he played centre as New Zealand Warriors fell one victory short of a consecutive Grand Final appearance. He scored two tries in his Test debut in the 30-16 win against Australia in October 2003. Anderson shifted to five-eighth and played with his younger brother Louis in four Test matches at the end of 2004 – including the 16-all draw against Australia and losses to Australia and Great Britain in England. He would play a couple seasons with Wigan before linking up with brother Louis at the Wolves and finishing his career at Salford.